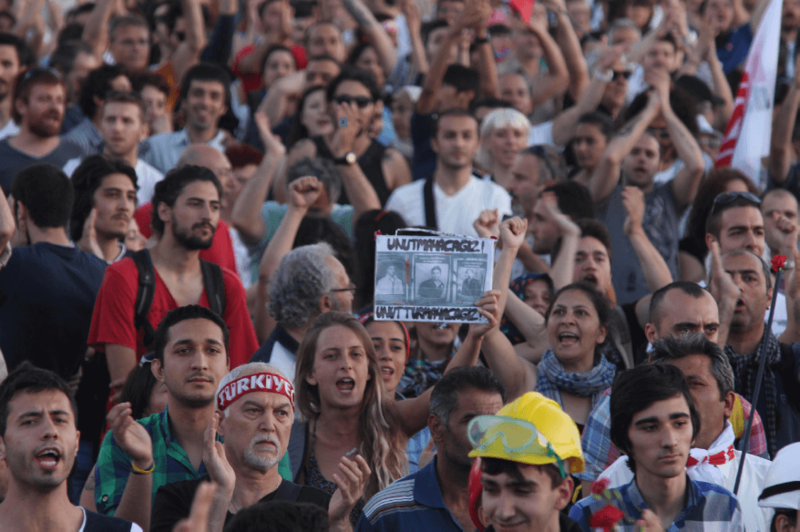 A woman at a demonstration holds up images of protestors killed during the June 2013 Gezi demonstrations, along with the words, “We will not forget! We will not let people forget!” Source: Gazete Manifesto. People in Turkey are once again called upon to go to the polls on March 31. This time around local elections are on the agenda. The administrations of provinces, districts and neighborhoods respectively are to be elected. One would think that local elections certainly have some importance, but are hardly decisive for the fate of the country as a whole. This is particularly the case in a country where there is an antique provincial government system – the vilayet-system inherited from the Ottoman Empire – controlled by central government, which concentrates many important decision making processes such as general budget of the provinces, police and military. However, the current regime in Turkey thinks otherwise. The ruling block of President Erdoğan, his Party for Justice and Development (AKP) and its main ally, the ultra-nationalist, fascistic Nationalist Movement Party (MHP) are constantly framing the upcoming elections as a matter of the survival of the Turkish state as such. How are we to understand such an enormous importance placed in local elections? Albeit the discourse of the current regime certainly is full of exaggerations, there is a kernel of truth to their panic: the authoritarian presidential system that AKP, MHP and their intra-state elite alliance have been constructing continuously fails to secure a stable social and political hegemonic order. Even though the regime uses a heavy hand on the opposition and has all the means of the state apparatuses– such as rigging election results, which has become normalized in the course of the last years – and the vast majority of the media at their hands, the aggressiveness with which they treat even the mildest and non-antagonist form of opposition belies their confident attitude. The upcoming elections have thus become a potential source of crisis – but also a stepping stone towards securing and perpetuating the current system of power relations in Turkey. In 2017 a referendum legalized a so-called “presidential system” which is rather a presidential dictatorship, yet the lack of mass popular legitimation the current regime is suffering from ever since the June Uprising 2013 hasn’t changed ever since. The approval of said system barely surpassed the necessary 50% threshold and multiple forms of fraud wereprobably decisive in determining the outcome of the elections. It is therefore not surprising that Erdoğan and his partner Devlet Bahçeli, leader of the MHP, called for snap elections of parliament and presidency for summer last year and they did so right after the invasion of the Turkish army into the Kurdish-held canton of Afrin in North Syria (January to March 2018). The timing was no surprise: polls showed that the Afrin invasion had high approval ratings, yet popular trust in institutions and media was extremely low and the AKP-MHP alliance as such did not gain any further backing. Those elections were originally supposed to take place in November 2019. But Bahçeli already back then pointed towards the possibility that adverse results of the communal elections of March 2019 might have further negative effects in November 2019. Erdoğan, on the other hand, pointed to foreign policy issues (especially in Syria) and the economy (which was already sliding into crisis) as some of the reasons why it was necessary to get the insecurity entailed in elections out of the way. The election results of June 24 2018 themselves were a continuation of the situation of the logjam of power relations that has characterized the country throughout the last years. Neither was the dominant bloc grouped around the AKP/Erdoğan able to gain a decisive victory nor was the oppositional bloc able to strike a decisive blow. For this reason, the first elections since last years’ presidential and parliamentary one have become yet another popular vote on the presidential dictatorship. As rigged, fraudulent and distorted as they are, elections still reflect mass popular discontent in a fragmented way and this already is too much for the current regime that is struggling with its own instability. In addition, there is a specificity of municipal elections in Turkey: especially the lowest ranks of elected municipal administrators, the so-called mukhtars (neighborhood headman), play an important role in the construction of legitimation for the political regime. They are the ones that have the most detailed information about locals and in turn determine the distribution of social assistance which is not strictly law-regulated but dependent on arbitrary decisions. That is also the reason why Erdoğan has held more than 40, often quite neglected “mukhtar meetings” in his presidential palace. The instability of the current regime results from a lack of mass support and legitimation, mostly due to rising authoritarianism and material hardship. The increasingly authoritarian way of ruling and, in fact, outright fascization as means of coping with the hegemony crisis was not successful in regaining legitimacy among antagonized parts of the populace. However, it did succeed in constructing a new national power bloc that reinstated the AKP/Erdoğan as the leading political subject. For this to take place, Erdoğan and his AKP had to concede more and more power and legitimacy to former antagonists in state and society that can be categorized as the more classical nationalist right-wing camp. The most prominent factions in this camp is Bahçeli’s MHP but it also contains the lesser-known Patriotic Party (VP). Maybe even more important are the elements that gained fame through the various political show trials of the AKP and their erstwhile partner, the Gülen clique (“Ergenekon”, “Balyoz”). Once imprisoned for supposedly plotting against the government, they are now back in powerful positions within the state to fill the ranks once dominated by the Gülenists, though they mostly refrain from public appearance. This alliance is a transitory marriage of convenience, not of principles, as Bahçeli’s comments after the elections of last years – namely that the MHP is “a key party” now – showed clear enough. While we should not underestimate the fact that Erdoğan by now indeed concentrates most of state power in his hands – and he was very swift in turning his concentration of power into law since last years’ elections including his sway over the judiciary –, there’s more to the state than only one man’s commands. It is obvious that the MHP, VP and especially the nationalist-etatist elite cadres that form integral elements of the current national power bloc try to use the AKP and especially Erdoğan as the visible and as such popularly responsible face of the current power bloc that organizes popular consent. They do have their own interests though that are far less compatible with a strategic partnership with the AKP. It is no surprise that the MHP and the other elements of the national power bloc other than the AKP in most of the cases deliberately abstain from taking over representative executive functions such as ministries and rather focus on taking foot inside the state apparatuses, especially the military. Interior Minister Süleyman Soylu, a representative of the counter-guerilla of the 1990s who does not come from the AKP-tradition, is an important exception to this rule. The exercise of power is much more a matter of deals and games between the elements of the new power bloc than Erdoğan’s towering image might suggest. Since processes of consensual politics that smooth out the fierceness of political differences have more and more been disposed of, differences and differing interests are more and more openly acted out. Bahçeli has not been the only one voicing demands or strong criticisms of the course of events to the public, but he certainly is the most vocal one. In a political system where decisionism – the ability to make facts by the political sovereign without or even against the constitution – becomes the main form of doing politics, the dominant political subject is forced to constantly make facts. In such a system, only the permanent show and application of power has a chance to gain the consent of allies, who otherwise think themselves to be the better sovereign – and thus would act accordingly. In this situation we are now again witnessing how the complex hegemonic crisis on the one hand and the contradictory condition of the authoritarian-fascist state alliance on the other hand unfolds and progresses in the forerun to the elections. In fact, the circumstance that AKP and MHP are again running for the communal elections as an alliance – the so-called “People’s Alliance” (Cumhur İttifakı) – is itself a consequence of the hegemonic crisis: when polls showed that the AKP by itself might be facing an electoral disaster in the elections, Erdoğan renewed talks for a continuation of the alliance. In other words, it was far from clear that there would be an alliance again and it was the declining outlook of the AKP that made it depend on the MHP. The MHP in turn has far outgrown initial perceptions of “being the lapdog of the AKP.” Though it conceded the “three big cities” (Ankara, Istanbul, Izmir) to the AKP – meaning they would not position their own respective candidate and instead support the AKP candidate – Bahçeli was swift to warn that they had demands too. These were that the AKP supports MHP candidates in other big cities (Adana, Mersin and Manisa) – otherwise they would race against the AKP. By now, it is clear, Bahçeli’s MHP is aiming to regain the strong footing within the nationalist camp that it had in the 1990s. Conflicts concerning the case of Pastor Brunson, a nationalist oath in schools and amnesty for nationalist mafia chiefs were further proof of a power struggle between the allies. And the nationalist block was successfully gaining ground. In addition, one of the last remaining independent and oppositional newspapers, the Cumhuriyet, the flagship paper of the main opposition party, the Republican People’s Party (CHP), was cleansed of its liberal-democratic leadership by yet another one of the now famous “judiciary coups.” The court handed it over to the ultra-nationalist, pro-military wing of the secular nationalist camp, which had previously been displaced by the liberal-democratic wing around Can Dündar. Dündar has been in exile in Germany, facing a life sentence back home for his reporting on an alleged clandestine shipment of arms to the Syrian front; among the paper’s new trustees are those who cooperated with the government in the case against him. Though his old newspaper still presents a pro-CHP stance critical of the AKP, on the important military front it now toes the line, much to the chagrin of those among its readers who had come to value the paper’s oppositional stance. The hostile take-over of Cumhuriyet adds another link to the chain of media kidnappings, all of which have strengthened nationalist and militarist camps. Having been pressured for years, the proprietor of another of the last remaining big independent newspapers, Hürriyet, sold the paper and the country’s biggest private news agency to a pro-AKP holding last year. The German Foreign Ministry calculates that 90% of media is personally and financially intertwined with the AKP by now. However, despite all efforts, this Holy Alliance is not faring too well so far. Albeit opinion surveys showed even worse results for the AKP a couple of weeks ago, they still show a further fall in the vote for the AKP in comparison to the 2018 elections, while the lowest estimates hover just above 35%. In the meantime, a fullblown economic crisis has kicked in that has disastrous effects especially on working people due to horrendous price inflation of kitchen goods. And the worst is most probably yet to come. It is no surprise then that in all surveys since last summer, “economy” is way ahead of any other topic in the list of “most urgent problems of Turkey”. As internal surveys of the AKP proved that the scope of the alliance is not enough to stop crucial defeats, AKP and MHP agreed to enlarge the scope of their alliance to a total of close to 50 of the 81 provinces. More important is the fact that in all surveys of polling companies, but also of the big political parties themselves, Istanbul and Ankara, the key two big cities of Turkey, remain closely contested up to this day. In Ankara in particular the opposition candidate Mansur Yavaş is favored to win the race while in Istanbul things seems to be very close. Since these cities are seen as and indeed are key to the country and the elections are rightly so perceived as elections on the popular legitimacy of the presidential dictatorship itself time and again also by higher cadres of the ruling alliance, tensions are running very high within the ruling bloc. That is why a tornado of repression, threats and repression is being unleashed once again upon the country in order to remain in control – but these tensions also caused splits and possible breaks within the alliance and even affected opposition parties. Rampaging out of the crisis? Maybe the most absurd and outright otherworldly case makes the point in case: When in October 2018 thousands, later millions in France started protesting a manifold of social problems in their country thus initiating the Gilets Jaunes movement, the ones to react most fiercely besides the French President Macron and Egypt’s al-Sisi have been Erdoğan and Bahçeli. While the Interior Ministry launched an investigation whether the production and trade of yellow wests in Istanbul went up in order to find out whether there is a Yellow Vests movement imminent in Turkey – the investigation, what a surprise, finds out that the answer is no –, Bahçeli openly threatened those who dare try to begin such a movement in Turkey with violence and torture. Such is their fear of social upheaval in their own country. The threats against the phantasm of a Yellow Vest movement however came to their own once real social upheaval took place: When thousands of workers stopped working on the construction site of the prestigious Third Airport of Istanbul due to disastrous working and living conditions, military police intervened and took hundreds of striking workers with them. The as usual massive Feminist Night March on March 8 2019 – a constant object of resentment for the AKP– was drowned in gas and rubber bullets while Erdoğan up to this day seeks to portray the demonstration as anti-Islamic due to the women supposedly shouting slogans against the Islamic prayer, ezan (of course these allegations were proven to be completely wrong, even by pro-AKP journalists and indeed Muslim feminists). As usual, official hate speech and demonization by leading political figures was only a motor for way more aggressive actions and stances by the unofficial fanatics: In this case, a strongly pro-AKP foundation, TÜGVA, defended the ezan as “refreshing our intention to conquer Rome, New York, Beijing, Tokyo, Moscow, Berlin and Paris and to take care of the unfinished business of Vienna.” To nobody’s surprise, it turned out that portraying the March 8 Feminist Night March as “anti-Islamic” was deliberately used in order to gain votes. Another symptom of high tensions and the fear about adverse elections results are the preparations for electoral fraud. Already before the elections, rigging and fraud is bubbling up in the form of so-called “ghost voters” (persons over 100 years old), or sudden resettlements of some voters’ ballot boxes and the like. Critics say that these forms of fraud are to be encountered especially in regions and provinces where voting results are thought to be very close. On top of it, independent computer engineers have found a systemic gap in the electronic vote counting system (SEÇSİS) that allegedly lead to quite some wrong and rigged results in the elections in 2018. They point out that their analysis covers only a very fringe part of the total vote and that the systemic gap could lead to enormous exploitation everywhere in the system. All this as well as the experiences of the last years show that we can and should not expect “normal” elections. The central question is rather to what extend fraud can be prevented and curtailed and if and where such fraud will be decisive in determining the results. Last but not least, the continuation of the hegemonic crisis together with the continuously bleak perspective of the authoritarian way of handling the crisis has – as became usual in the forerun to elections in the last years – lead to panicking and estrangement among the ranks of the AKP with one major break seeming to be imminent this time around. Many ex-MPs and pro-AKP journalists have warned of too confrontative and polarizing attitudes, clearly fearing an electoral loss and being held responsible for all the wrongdoings one day; some provincial administrations and local party leaderships even resigned. As a novelty, all the disgruntlement seems to lead to a major split, the formation of one, possibly two new parties from among ex-AKP high cadres. While the phantom of a new party from among ex-AKP ranks was spooking around for such a long time that nobody believed in it anymore, this time around things seem to be serious. It is said behind the curtains that former chiefs of economic policies Mehmet Şimşek and Ali Babacan together with the ex-foreign policy strategist of the AKP, Ahmet Davutoğlu, will launch their new party right after the communal elections while the status of the Great Mediator, the ex-President Abdullah Gül, and the ex-party strategist and presidential aide Bülent Arınç, both of whom were among the original founding cadre of the AKP, remains shrouded in mysteries. For quite some time, these figures positioned themselves as the spokespersons of those AKP cadres that feared that the authoritarian course of Erdoğan and the alliance with the nationalist camp would not end well. Even before any concrete details emerged hell broke loose. Possibly more important than Erdoğan’s threats towards the supposed “traitors” was the intervention of the éminence grise, the former Justice and Interior Minister and Anti-Terror-Police expert Mehmet Ağar, one of the chief architects of the counter-guerilla of the 1990s. He had openly defended the thousands of illegal kidnappings and extralegal executions of opposition members in the 1990s “for the sake of the state” and identified the deep state as “the will not to retreat.” Ağar, who seldomly appears in public, put it in more diplomatic terms, namely that the dominant bloc does not at all approve of the supposed new party formation. In a more recent statement he added – obviously in an approving manner – that Erdoğan is an “anti-imperialist” and that it would be a necessity that the People’s Alliance has a strong showing in the elections. Ağar’s interventions yet again testified to the marriage of convenience between the AKP and the nationalist camp. The main force aligned against the People’s Alliance is yet again the Nation Alliance (Millet İttifakı), founded last year under the leadership of the ages old Republican People’s Party (CHP) and the MHP-split Good Party (İYİ Parti) – promptly denounced as the şer ittifakı, that is the “evil alliance” by Erdoğan (albeit “Unholy Alliance” is surely a better translation). Although the political contest is waged in an extremely polarizing and aggressive manner by the AKP-MHP bloc, one can hardly call the Nation Alliance a genuine, fundamental democratic opposition – neither an opposition to Erdoğan and his alliance, nor to the new presidential system in general. Indeed it makes much more sense to talk of the Nation Alliance as an alliance of the forces of restoration. That is, it is an alliance of those parts of the political and economic elite that deem the dominant bloc’s politics way too risky for the social and political order of Turkey – while they accept the existing social and political order per se. More so, they even want to strengthen it against any potentially real and fundamental opposition. Events in the last years such as the CHP approving of the illegal lifting of parliamentary immunities – which enabled a major attack against the HDP –, supporting nationalist-chauvinist military offensives and its reluctancy to turn any of the popular uprisings against the AKP’s wrongdoings and electoral fraud into an advantage have just been the newest elements of an entire history of inconsistent and inefficient opposition to the AKP. It is no coincidence that a recent statement by the party’s long-standing leader Kemal Kılıçdaroğlu, implying they would not call for snap elections even if they should win the “three big cities,” reminds one of his words in 2017 that a potential rejection of the presidential system in the referendum would “change nothing” in politics. Having thus presented the “no” vote as a vote for stability, Kılıçdaroğlu ruled out calling for snap elections in the case of a “no” victory, thus effectively undermining his party’s opposition to Erdoğan’s power grab–in fact enabling it to succeed. Putting stability first, Kılıçdaroğlu then chose to compete on Erdoğan’s chosen ground–as he is doing today as well. The IYI Parti on the other hand is itself a split from the MHP that was formed under the leadership of former Interior Minister Meral Akşener as a nationalist and anti-Erdoğan reaction to the AKP-MHP coalition some years ago. Akşener, known to be a hardliner regarding the “Kurdish Question” in the 1990s and particularly in her period as Interior Minister, is now supposedly a liberal-conservative “Iron Lady” that could beat Erdoğan. Superficial analogies aside she remains hard as iron on several issues. Not only does she call for a total military assault on Northern Syria – the Kurdish-led Rojava –, but also thinks of the presidency as an institution that is safeguarding “our independence.” When she commanded that the IYI Parti candidate for the predominantly Kurdish province Ağrı should retreat, arguing that “the system races against the HDP” and she would rather see the People’s Alliance win there than the pro-Kurdish leftist HDP, this was just the most obvious point in case. As a logical consequence, there was never a serious debate whether the HDP should be included in the Nation Alliance. We would not have needed publicized strategy documents of the CHP to show us that the CHP leadership is obviously aiming to win over right-wing voters by means of appeasement – rather than push for a systemic alternative that could maybe also mobilize parts of those that now vote for right-wing parties. Presenting a liberal-conservative candidate in Istanbul (Ekrem Imamoğlu) and a – not really “formerly” – ultranationalist in Ankara (Mansur Yavaş) as much as kicking out often quite successful local mayors in Istanbul from election lists was proof enough for that. Also the utter lack of any alternative economic policy model differing from the neoliberal status quo is daunting. This inconsistent and even mild, restorative opposition to a dominant bloc that is driving Turkey from one crisis to the next, risking ever greater crises, proves yet again the etatist, even despotic consensus of the leading elements of the ruling elite in Turkey. In the last instance it is the supposed unity of the eternal state – may it be as despotic and ruined as it is nowadays – as supposed guarantor of the social order of Turkey that has to be defended against all odds. Even if those managing the eternal state are risking the integrity of that very order. Such, Erdoğan’s excessive talk of an “Unholy Alliance” is rather aimed at concealing the very holiness of the main opposition alliance, a holiness that is one of the most important secrets of his political survival. In general, most parts of the opposition have been labeled as “terrorist” or at least as beeing supportive of or working together with “terrorists” time and again. And the whole show did not go down without a cameo appearance of the infamous-again Sedat Peker, the ultranationalist mafia boss who was an ardent enemy of Erdoğan only to then endorse fanactic Erdoğanism. Rising to renewed fame due to his wish to “bath in the blood” of the Academics for Peace in 2015, he now made headlines for calling for the armament of “real” Muslim Turks. In any case, the situation of explosive social tensions and of the hegemonic crisis further aggravates the contradictions also within the political parties of the opposition. When stakes are getting higher and panic, fear and anger are taking over, intense and hesitant reactions increase. The crisis of the CHP continues as differences concerning the management of the party. The defeat in last summer’s elections and the authoritarian style of its leader Kılıçdaroğlu and his circle mix with discontent over the political inefficiency of the party. An earlier attempt of supporters of a wannabe alternative leader of the CHP, former Presidential candidate Muharrem Ince, to call for an extraordinary congress in order to supplant the current leadership failed, however discontent among the rank-and-file continued. A huge wave of complaints and resignations from all across the country came in once the CHP named its candidates and municipal council lists. While we should be careful in naming the reasons for this massive discontent – there were surely also very egoistic reactions concerning one’s own comfortable seats –, it seems to be the case that in general those incompatible with a right-wing re-orientation were discarded. The leadership, in turn, was criticized for acting as dictatorial within the party as Erdoğan was reigning in the country. Within the IYI Party, in turn, the cowards began leaving the boat right after last summer’s elections for a variety of reasons. And indeed what use was there for a split if what it split from did actually work much better than anybody had expected? For some time, the crisis within the IYI Party went as deep as Akşener retreating from the leadership position. It is rather a surprise and proof of the political skill of Akşener that her party is still playing a role and indeed is most probably about to regain strength. The real “Unholy Opposition” is even more unbearable to the dominant nationalist bloc. That is the independent, pro-Kurdish left People’s Democratic Party (HDP). It was the HDP with thousands of its members in prison and hundreds taken in custody within the last months that – as usual – bore the brunt of the onslaught. The HDP has for years been the only real oppositional party in parliament that did not succumb to the mantra of the “survival of the eternal state”. Albeit often not very anti-capitalist and not even revolutionary, it has more and more become a focal point for all oppositional democratic and socialist forces in the country fed up by the etatist inefficiency of the “holy” opposition and those willing to fight the struggle for democracy together with the Kurds. Since the perspective of an effective alliance of democratic and socialist forces with the Kurdish liberation movement is the nemesis of the Turkish state for it would call in question the very fundamentals of the social order, the HDP consequently has been the target of the most ferocious repression. In spite of all of this, and in spite of being excluded from the oppositional alliance, the HDP has acted in accordance with its interest to weaken the AKP-MHP bloc. This has taken the form of unconditionally and unilaterally not nominating candidates in many important regions and cities in the West, thus de facto supporting the Nation Alliance. While this has been portrayed by the People’s Alliance as a hidden secret alliance of CHP and IYI Parti with HDP – and as such with the illegal Kurdistan Workers’ Party (PKK) –, it is rather the case that CHP and IYI Parti themselves feel rather uncomfortable with this decision of the HDP to support them. Only in certain parts of the country where the left wing of the CHP prevails – such as in Izmir and some districts of Istanbul – did CHP and HDP enter into a more direct alliance that expresses itself in the CHP granting the HDP positions on their lists for municipal councils, while the HDP tries to mobilize its base to vote for the Nation Alliance. In the East, that is in the predominantly Kurdish parts of the country, the HDP seems to be yet again on the rise despite a de facto permanent state of emergency, the replacement of most of its mayors by centrally appointed trustees and the destruction of towns and urban districts in the military conflicts of the last years. Not surprisingly, Erdoğan has already made clear that he is most probably going to appoint trustees again in place of the elected mayors. In fact, the last week before the elections has seen a runaway of hysteria. In an obviously coordinated maneuver, pro-government media have published dozens, maybe hundreds of names and details of supposed “PKK terrorists” on the municipal council lists of the CHP, while the Justice and the Interior Minister threatened to immediately remove them from their functions should they get elected. All this points to the fact that a political party close to the Kurdish liberation movement has become an undeniable reality of Turkey whatever the circumstances – at least for now. On top of this, the HDP has again become a game changer: in many cities in the West the voting behavior of Kurds will be central in deciding which candidate will win. While the hegemonic crisis and the fascization process accompanying it processes in its contradictory and crisis-ridden way, a difficult to grasp social undercurrent gains strength. A gaping void is opening right in the midst of society that far outgrows what in political sciences is termed “representational gap” of democratic societies of late. While Turkey races to invent new parties and supposedly new styles to organize people’s discontent, the confidence of growing parts of society in all central institutions of society is in freefall. Polling companies already had been reporting throughout the last years that people stopped giving answers to surveys for fear of consequences. Now, “something is not right”, as the chief of a polling company would put it. He refers to the circumstance that the number of those that are unsure what to vote remains exceptionally high in comparison to earlier years. Many similar surveys would show that there is not only no trust in media and the justice system anymore, but also in the entire system of political parties. In fact, most of those that are unsure what to vote come from the potential voter basis of AKP and CHP. And indeed, how could the AKP appeal anymore to a youth that is getting less and less religiously conservative and instead more and more modern with ultranationalist propaganda and pseudo-religious fanatic zeal? Does, on the other hand, the CHP really believe it can stop its secular tendency to decline as a party appealing to the masses, by showing the cold shoulder time and again to the active parts of its base that are fighting for democracy on the streets? On the one hand, after 17 years in power, the AKP was and still is not successful in constructing a new constitution and a new society aside from concentrating state powers and agitating the people as much as possible against supposed enemies. Islamism, as Kemal Can correctly assesses, is in actual decline in Turkey and at the mercy of Erdoğans charismatic leadership; if at all, it is a regenerated nationalism that again comes to the forefront. Yet that nationalism is also far from stable; indeed, MHP and IYI Parti have experienced the most volatile fluctuations in their respective voter bases in the last years. On the other hand, six years after Gezi, no party did, as of yet, manage to capture the spirit and energy of that mass uprising in order to struggle for a new, a revolutionary democratic Turkey – least of all the CHP. Neither was it determined enough to seriously contest the electoral fraud which it itself had documented over and over; nor is it willing to seriously defend even its own parliamentarians from political show trials. The political system has a tendency to abstract itself from parts of the populace. Or, it is rather the case that parts of the populace begin to turn away in resignation and discontent from a political system that no longer deserves to be called one but increasingly becomes, in the face of a deepening social crisis, a farcical game in which the choices and battles of the popular strata have no effect at all. That social void – and it is far from being a distinct and clear-cut identity – is not a power in itself, nor is or can it be a challenge to the order simply by existing. And we should not overestimate its scope. There will still be millions taking to the voting booths. But still, it is an important new social phenomenon in Turkey’s society and – one of the possible sources for a real regeneration of Turkey’s society. So what is going to happen on election day and after? We should not invest too much hope in the elections as such and that is not only because there will be no “normal” elections as there have not been in the last years. The powers that be will again be using all means at their use through their control over the state in order to rig the elections. Whether or not the oppositional bloc will win over the “three big cities” and more – which, from the surveys, seems not improbable – will thus not only depend on voting behavior but also on the willingness of the main oppositional parties to combat illegitimate fraud. Whether their perception of the risks of a further deepening of the structural crisis of Turkey’s social formation dominates their decision-making or their allegiance to the “unity of the eternal state”, we will find out on election day. And then again, it is far from clear if the main oppositional parties would challenge the current system in a more serious fashion than they did throughout the last years. In any case, more important than the respective party leaderships are the voters and their stances. They can make all the difference in the world. The higher the real difference in the election results – that is the results without fraud – and the more determinate people are in defending those results – as they were, to a certain degree, in the last years – the more difficult it will be for the regime to cover up the fraud; and the more likely will the oppositional bloc be forced to actually fight for the election results. It cannot be stressed enough how important defending the real results are from a point of view of social struggles. Remember how much morale went down in the last two years when massive fraud took place in front of everybody’s eyes – and nothing was done against it. On the other hand, unmasking fraud via mass protests on the streets is not only the most efficient way to further delegitimize an already illegitimate regime; it can also function as a necessary motivator for popular mobilization and the struggles to come. Mobilized, autonomous and combative popular masses in action checking the regime but also keeping an eye on the forces of restoration will be the only means of initiating a more sound turn of the tide following the elections. Ant there is not only a lot of discontent broiling beneath the surface; there is also manifold resistance in society to authoritarianism and neoliberalism. Albeit public mass demonstrations are mostly quickly repressed, every once in a while the regime cannot prevent thousands, sometimes millions from taking to the streets. Remember the single huge CHP-led demonstration on Taksim Square in 2016 against the military coup but also against the AKP that was held responsible for the coup and similar meetings encapsulating millions of people in 2017 (in the wake of the Justice March) and 2018 (in the forerun to the elections); or the mass meetings the Kurdish liberation movement is able to stage before elections or on Newroz, the traditional spring festival on March 21. Moreover, working class activity is high if fragmented. Especially in the construction sector, there is a myriad of small and local wildcat strikes and protests due to worsening working conditions. But then again no year passes without at least one big strike of unionized workers and all of this happens despite the vast majority of strike activity being declared illegal immediately. That the recent attempt of an offensive on all remaining forces of social opposition via an all-out attack after March 8 on the currently most active dissident element, the feminist movement, did actually completely backfire is something we should take serious. Albeit gangs of a couple of hundred fanatical Islamists took to the streets to protest the supposed “anti-Islamic” character of the March 8 demonstrations and many higher authorities tried to fan the flames, they utterly failed in generating any meaningful approval. At the end of the day, the women* resisting police violence on March 8 were the ones being victorious. The regime is not as powerful as it likes to portray itself in the media which it does dominate, nor are the social resistance dynamics as weak as the regime would like them to be. And that’s wherein lies the kernel of truth concerning the discourse of the “survival of the Turkish state”. The current system in Turkey is in a deadlock and its crisis potentially mobilizes wide layers of the population. In their struggles, the demand for a democratic republic gradually crystallizes. This possibility of a mass struggle for a democratic republic, as a demand of wide layers of the population, exceeds the base of the HDP by far. It encapsulates the left, the HDP, parts of the CHP and maybe even parts of other parties as well, who are voting for those parties due to habits. However, capitalism in Turkey was built upon anti-democratic and despotic foundations; the autonomous demands of popular forces have, for most of the time, been utterly repressed or very heavily restricted up to this day via a despotic state tradition. The current hegemonic crisis has reached such a quality by now that it risks conjuring up forces that radically and practically put into question those fundamentals of the social order. This might be the central reason for how otherwise apparently disparate camps such as political Islam and the diverse elements of nationalist etatism can stand together to try to stem the tide. In conditions such as prevail in Turkey today, any election can be just as farcical as elections become under dictatorships – or turn into a signal that initiates a period of mass struggles.